In 1999, the brilliance of CrownRing was introduced to the world of Canadian jewellery. This hometown brand has introduced some of the most elegant choices in bridal pieces to our customers, and we’re pleased to be able to be an authorized retailer for their wedding bands. What sets CrownRing apart is their commitment to elegant texture: brushed gold, repoussé, burnished diamonds, and angular architecture are standard for the quality of every CrownRing wedding band. Whether you’re a groom-to-be or a blushing bride, Damiani Jewellers is ready to pair you and your partner with the bands of your dreams. 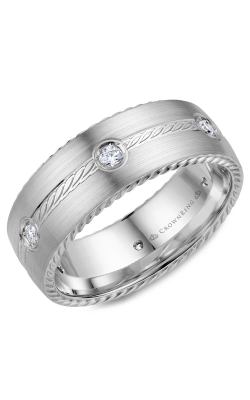 One of the most brilliant lines of wedding bands we offer at Damiani Jewellers is the CrownRing Classic and Carved collection. This collection contains the lion’s share of CrownRing’s most traditional and well-loved styles. This line is typified by one-of-a-kind textures. Brushed gold is the most iconic CrownRing classic, but one can also find rings whose faces have been etched like the bark of a tree, hatched like a length of denim, engraved like houndstooth, and even scored like a sheet of wild jazz music. All CrownRing pieces are available in 10k white, yellow, or rose gold, 14k, 18k, 950-purity palladium, or platinum. While the Diamond collection is named for the fiery brilliant stones that are used in the construction of these bands, they’re possessed of the same uniqueness that CrownRing invests in all of its jewellery. The burnished and channel-set diamonds, as well as the diamonds set on the underside of the bands, have a kind of modern chic that sets them apart from other designers’ use of diamonds. The Rope collection also takes part in CrownRing’s ultramodernist inventiveness—each band features somewhere in its design a rope made from twisted precious metal. Often, these ropes are made from a different shade of gold, making an elegant two-tone design that can’t be missed. Why Shop for CrownRing at Damiani Jewellers? Damiani Jewellers knows jewellery. And we know our customers in Woodbridge, Ontario. For over 60 years, we’ve gotten to know both, and we know what it is our customers are looking for. That’s the reason we showcase CrownRing wedding bands, and why we showcase bridal jewellery from other atelier designers in our industry. Also, we are the Greater Toronto Area’s premier jeweller in the fields of Swiss-quality timepieces, fashion jewellery, and GIA-certified diamonds. For those looking to keep their new treasures radiant for decades to come, don’t forget that we are also a full-service jeweller and we offer on-site repairs to our customers.